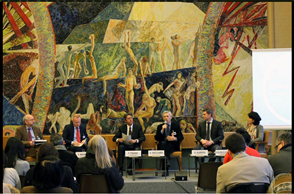 The panel discussion entitled “Silent Victims of War: Cultural Heritage at Risk in Conflicts and Crises: the case of Syria seen through UNOSAT satellite imagery analysis” was held at UNOG Library on February 5, 2015. The discussion moderated by Francesco Pisano Director of Research and Technology Application Knowledge Systems at UNITAR, featured the participation of prominent speakers: Einar Bjørgo Director of UNOSAT, Vittorio Mainetti from the University of Geneva, Blandine Blukacz -Louisfert Chief of the Institutional Memory Section at the UNOG Library, Giovanni Boccardi Head of Unit for Preparedness and Emergency Response of the Cultural Sector of UNESCO, and Peter Stone Blue Shield International Secretary. The group of panelists agreed upon the concept of cultural heritage being a silent victim of war. Cultural property (or cultural heritage) refers to any property that has a special relationship with a particular culture or nation, it includes objects found in archaeological sites, as well as works of art produced by members of a civilization which are believed to embody or represent culture in a distinctive way. The vicinity of the definition is vastly vague and shifting, but controversies over the use of cultural property are real and pose major challenges to national and international law. It is important to highlight the crucial role that International Organizations and NGOs play in the direct safeguard of what is denominated a silent victim of war. The Director of the UNOSAT illustrated the role of the satellite image recompilation and analysis program by providing visual examples that compare specific targeted sites in Syria. These images allowed the audience to understand the extent of damage that a particular archaeological site can suffer in matters of seconds. As a result, the program enables UNOSAT to develop more effective preventive and intervention programs for the safeguard of cultural heritage. Under international humanitarian law, warring parties must refrain from any act of hostility directed against cultural property. However, the history of war is also the history of the progressive loss of invaluable treasures, some of which belong to our collective memory. Mobile and immobile cultural heritage in addition to the intangible heritage of natural and cultural environment, represent values ​​that contribute to education, social development, and democracy. Cultural heritage is a significant part of the material and spiritual wealth of the world.